Color Protecting Shampoo is a gentle cleansing formula that restores moisture levels, improving the overall health and appearance of the hair. 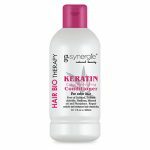 This formula is free of Parabens, Mineral oil and Phosphate which makes it safe for chemically and color treated hair. 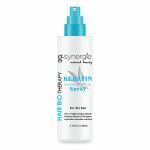 Replenishes moisture and isolate pollution and protects hair color, revives vigor of hair. Anti-inflammatory, contains antioxidant polyphenols, vitamin C and carotenoids. Aloe Vera has moisturizing and regenerating effect. Chamomile prevents inflammation of the skin. Works moisturizing, strengthening, smoothing. It elasticises and counteracts aging. Also prevents electrifying hair. Vegetable proteins reinforce the structure of the hair, moisturize and soften. They tighten the skin and create a protective film without oily coating. Wet hair, press moderate amount of shampoo and mix with water. Gently massage into hair and lather. Rinse with clean water. Repeat for best cleansing effect.